The cochineal, or “crimson,” scale has played what is perhaps a unique role for insects on the world stage, having parts in textile manufacturing, territorial conquest, international commerce, cosmetic production, food processing and even science and art. It seems too small a creature for such an outsized task. The female cochineal insect, colored by red pigment, measures only some one-sixteenth to one-quarter of an inch in length; the male measures about half the female’s length. She has neither wings nor legs; he has both. She has the shape of an engorged tick; he has more the look of a typical insect, with the addition of two distinctive filaments extending from the rear of his abdomen. 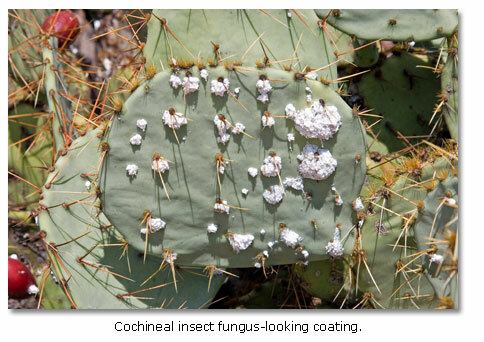 The cochineal covers much of the lower elevations in the western United States and Mexico, according to the Arizona Wild Flowers Internet site. It feeds almost solely on the pads of selected prickly pear cacti species. Like the aphid (a related insect) the female drives her tubular proboscis through the cactus skin, where she will remain affixed for the rest of her life, sucking out the juice. Simultaneously, she produces a white, waxy, fungus-looking coating that will help protect her from predatory insects and birds and shade her from the desert sun. She nevertheless sometimes falls prey to a rare carnivorous caterpillar and more commonly, to our good friend, the ladybird beetle. 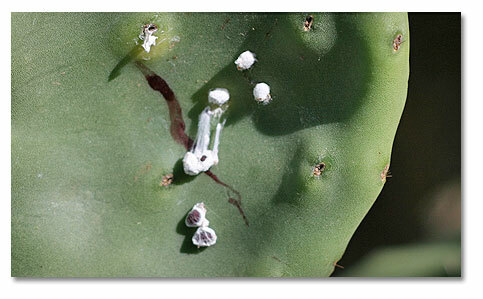 Over time, a heavy cochineal infestation can kill its resident plant. 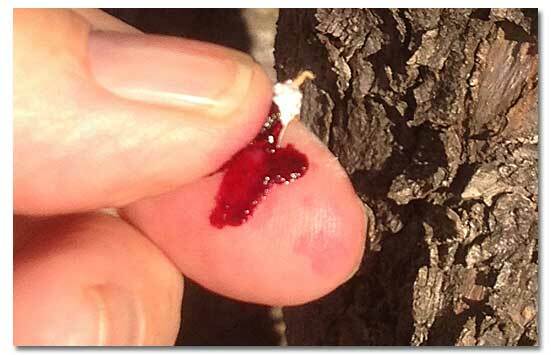 70,000 cochineal insects are required to manufacture a single pound of the dye. As she feeds, the immobile female cochineal produces eggs beneath her abdomen. When the eggs hatch, the legged juveniles, females and males, called “crawlers,” make their way to the edge of their home cactus pad. Wingless females produce long, ethereal filaments, which lift the insects on the desert wind. Some descend onto new host prickly pear cacti, where they will breed, make a new home, set a new dining table, molt and shed their legs, their traveling life over and done. Winged males take flight, searching for mates so they fulfill their role in nature’s plan. They die within a few days. As the Spanish discovered when they conquered Mexico in 1521, the cochineal scale insect, when crushed, yielded a supreme scarlet dye, which the Aztecs had long used in the production of exquisite textiles. The dye would become an added incentive for Spain in its Mexican conquest. The cochineal  the Spanish held the source of the dye secret for years  produced a major cash export from Mexico, second only to silver. Over time and across Europe, it would, according to Werner and Olson, bring the color scarlet to royalty’s garments, military uniforms, national dress, cosmetics, various foods, and even Michelangelo’s palette. It may have been used in the cloth that Betsy Ross used in making the red stripes for the first flag of the United States. The cochineal still serves as the source of the dye that microbiologists use to stain slide specimens, although it pays a heavy price for the privilege. Some 70,000 cochineal insects are required to manufacture a single pound of the dye. View Video about The Black Widow Spider. The female black widow spider is the most venomous spider in North America, but it seldom causes death to humans, because it only injects a very small amount of poison when it bites. Click here to view video. The Mountain Lion, also known as the Cougar, Panther or Puma, is the most widely distributed cat in the Americas. It is unspotted -- tawny-colored above overlaid with buff below. It has a small head and small, rounded, black-tipped ears. Watch one in this video.